Given the different approaches of scientific and historical enquiry, it is nevertheless from successfully tested hypotheses and confirmed observations and laws that theories about the world around us are developed. 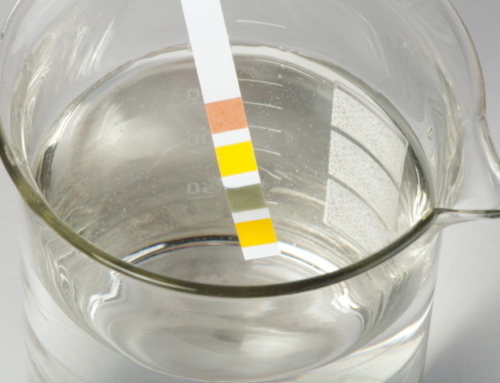 To provide a coherent story, the facts and observations with the supporting hypotheses and theories are brought together. For this purpose a model may be constructed. This is a hypothetical description or representation of the entity or process concerned and the interrelationships within it. These help to answer specific questions, find explanations and make comparisons or predictions. The current model to explain geological processes has developed over many years and can be used to demonstrate the development of a paradigm. Until recently it was generally believed that the map of the world had changed little and the mountain ranges formed from a cooling and contraction of the earth’s surface. However as early as the 16th century it had been observed that the continents on either side of the Atlantic appeared to fit each other. 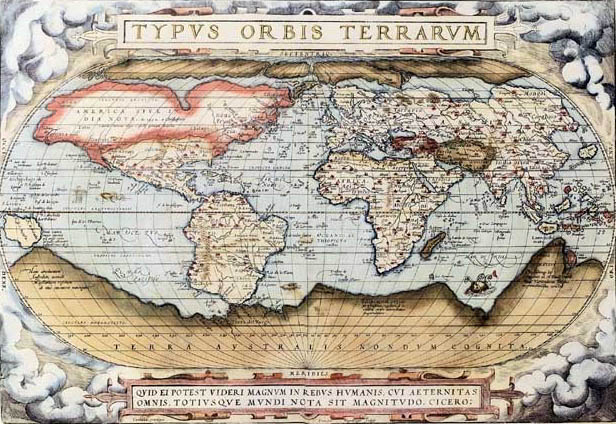 Abraham Ortels, who issued the first modern atlas in 1570, suggested that the Americas had been torn away from Europe and Africa. There the hypothesis rested in the absence of any known explanation of how the continents could have moved apart. From the mid-nineteenth century the idea was revived and the similarity of the geological formations on either side of the southern Atlantic were also noted. 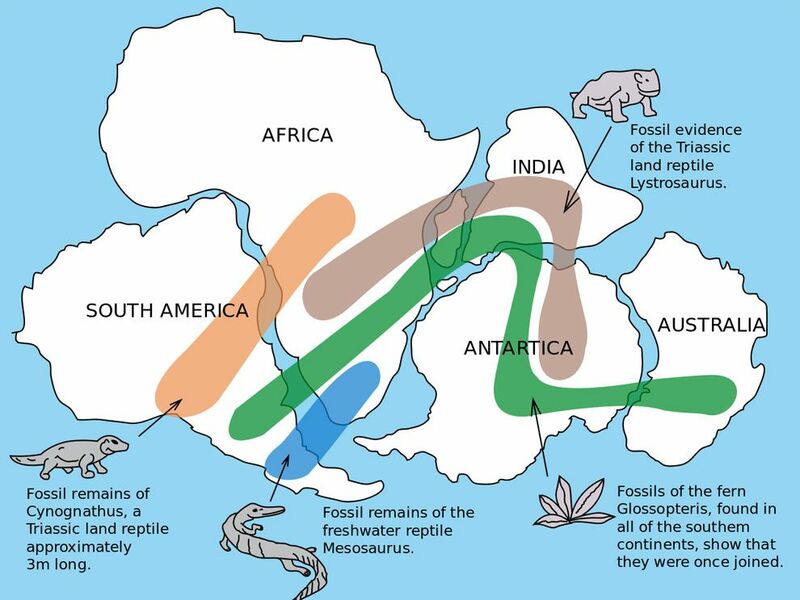 The presence of glacial sediments across equatorial America, Africa, India and elsewhere gave weight to the idea that there had been continental scale movement. 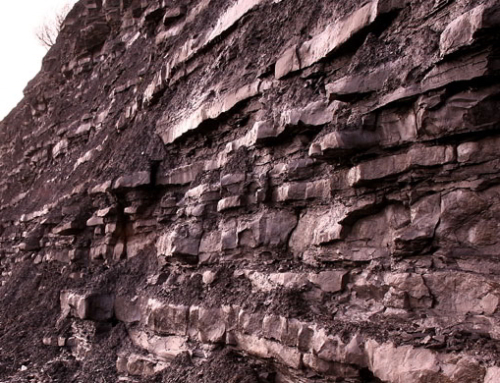 The fossil evidence also supported this view. Distribution of fossil flora and fauna across the continents. This was the state of knowledge early in the twentieth century. Alfred Wegener, a German geologist, was actively promoting the idea of continental drift but despite the evidence the scientific community refuted it. 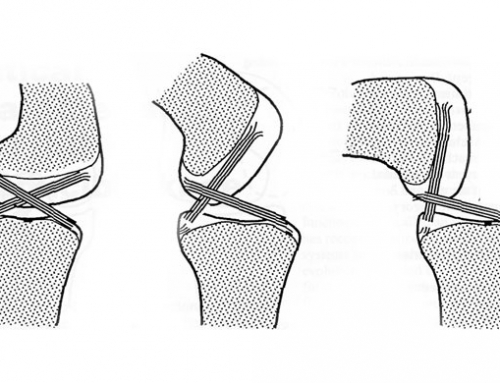 It was not until the 1960s that the idea was revived. Two discoveries were responsible for this. The magnetic orientation of iron minerals in solidified magma in igneous rocks of different date were found to have different orientations suggesting that either the magnetic pole or the continents had moved. 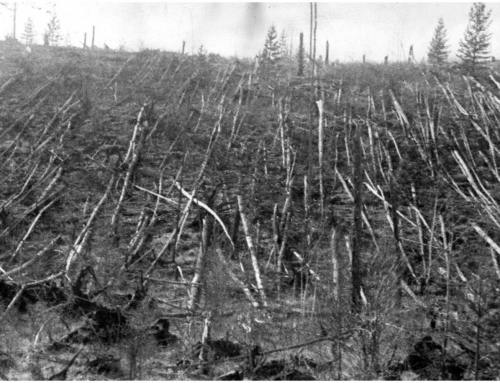 In addition the centre of many oceans were found to have a prominent ridge and fault-lines, suggesting a high level of seismic activity. 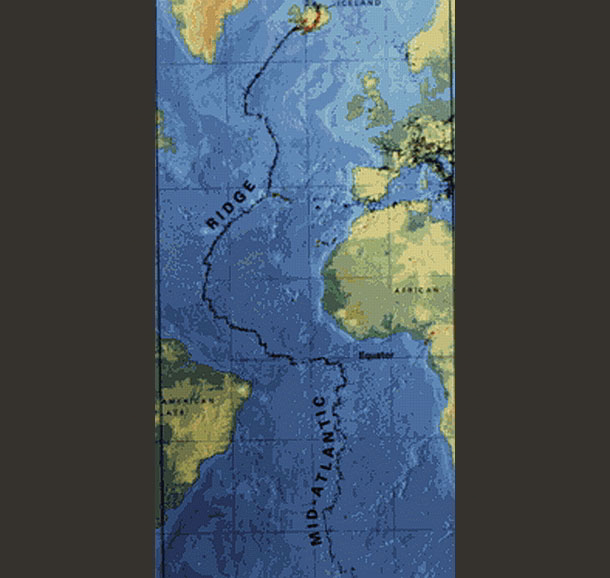 An example of this is the Mid-Atlantic Ridge, the tectonic plate boundary that separates the Eurasian and North American plates in the North Atlantic, and the African and South American plates in the South Atlantic. A deep rift valley marks the boundary where magma from the mantle reaches the seafloor, erupting as lava and producing new crustal material for the plates. It runs along the axis of the ridge for most of its length and surfaces in Iceland where the North American Plate has been shown to be spreading at a current average of about an inch (2.5 cm) each year. 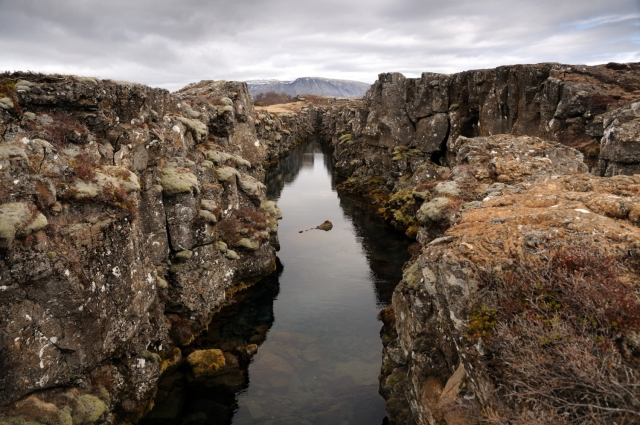 The Mid-Atlantic Ridge at Þingvellir, Iceland. The three types of plate boundary. It is from this evidence that the Plate Tectonic Model2 has been formulated to explain the physical structure of the world. The key principle of plate tectonics is that the lithosphere is formed of separate and distinct tectonic plates, which float on the fluid-like asthenosphere allowing them to move in different directions. 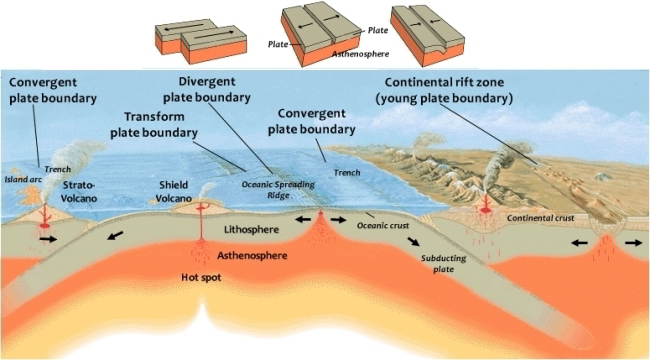 There are three different types of plate boundary depending on how the plates move in relation to each other and each is associated with a different type of surface phenomena.